Back pain is something that most of us will encounter at some point in our life. Good back health is an important factor in the relief and prevention of back pain. Correct posture plays a vital role in the health of your back. In seated posture your spine is under increased stress and maintaining proper spinal alignment is vital for correct posture. When viewed from the side a correctly aligned spine contains an ‘S’ curve. A back support needs to consider the spine’s contour, the user’s size, freedom of movement and the support needed for provision of relief and prevention of back pain and fatigue. 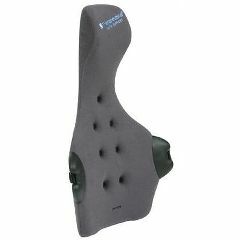 The Therapeutica Spinal Back Support has been ergonomically designed to consider all of the above criteria. **Sitting on a flat surface, measure from the seat to the top of the shoulders.